5793 labyrinths found. Showing 5661-5680. Sorted by country, state, city, then zip/postal code. The labyrinth is located in the treed area at the back of our property. When you come up the driveway, proceed to the back end of the parking lot, the back right corner. A mailbox with labyrinth information is at the edge of the path that takes you to the labyrinth itself. A few medium size pine trees and a beautiful apple tree among others give a sense of privacy, but are not so large as to make you feel secluded and unsafe. Two teak benches are placed in the center spring, summer, and fall. Take a seat and stay a while. The entrance may be blocked in winter when the snow is heavy on the ground. Paver lines set in decomposed granite "pebbles"
The labyrinth is located in Eichelman Park located next to the Southport Marina in downtown Kenosha, WI. There is a wide walkway that runs along the harbor and cuts through the park. Continue south on the walkway and you will come to a point where the walkway diverts in a circle around flowers/shrubs. Continue going straight, and just past this the walkway will divert again in a circle around a tree with benches placed at the base. The labyrinth joins up with the sidewalk on the left side of this second "loop." This is a public park, so enjoy! 2.5 miles west of Kewaskum, WI a former chapel and school building sits with hilltop vistas in the kettle scaped countryside. 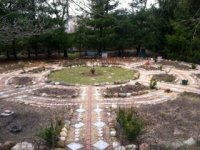 Bridget Center is a new 501c3 learning and spirituality center planning to restore 143 year old buildings and create Eden returned with our new labyrinth in the middle of the planned teaching gardens... Bridget's Gratitude Gardens. This labyrinth is located on Madeline Island. Take a right down Fort Road after getting off the ferry and proceed for .5 miles towards Joni's Beach. The labyrinth is located at Memorial Park. NOTE: Wheelchair accessible from inside building entrance only - outside access is by steps. 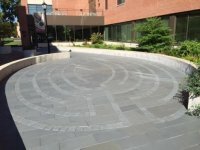 The labyrinth is located in the Chiara Healing Garden outside the School of Nursing - on the walkway between the school of nursing building and the Fine Arts Center. Located by the Peace Pole near the cemetery, healing herb garden and the Native American Medicine Wheel which is dedicated to Saint Kateri Tekawitha. The Chi Rho Labyrinth is based on a hexagonal seed pattern. Chi (X) and Rho (P) are the first two Greek letters of Christ. This is the first monogram of Christ used in the 4th century by Constantine's amry. When placed in a circle, it symbolized victory over death in Jesus' resurrection. 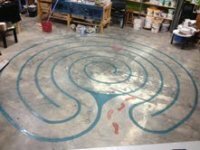 Located only one block from the state capitol building in the heart of downtown Madison, the labyrinth is a perfect place to "come away" and reconnect with the sacred center. Located in the Carpenter-Ridgeway Neighborhood Park, park on Carpenter Street and enter park at the Starkweather Creek Bike Trail sign. Follow the trail to the right, and labyrinth is beyond playground with backdrop of natural native Wisconsin prairie. Classical three-circuit labyrinth built using Autumn Red Holland Stone Pavers. The center consists of Sierra colored Cobble Pavers, with an inner circle of red thermo granite with an etched 1900 Gustav Stickley Arts & Crafts "Tree of Life" design. 43.06.830 N° Lat. ; 89.20.210 W° Long. Labyrinth is available for group and theme walks once a month and by appointment. Community Labyrinth is even open in the winter! The Community Labyrinth is located in the front yard of Wellspring UMC on the corner of Rosa Rd. and South Hill Dr of Madison, WI. This outdoor labyrinth is open to walk any time of day or night and features the relaxing Tree of Life pattern. It is usually shoveled in the winter for your enjoyment. Come, Walk with Us! There are three labyrinths available: A Medieval, a contemporary and a classical. 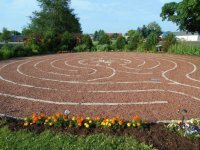 Our outdoor labyrinth is open to the public for use at any time. Please be respectful if a church service or event is going on. The labyrinth is located behind our main church building. To reach it, park in our parking lot and follow the paved path from the eastern side of the lot. The labyrinth is up a small hill on your right. We do not clear the labyrinth during snow season. Corner of Brooks and Delaplaine. Enter through the hospital - the labyrinth is in the outdoor garden and is open to the public. Design has one line of symmetry, separate entrance and exit, path goes around but not to the center.